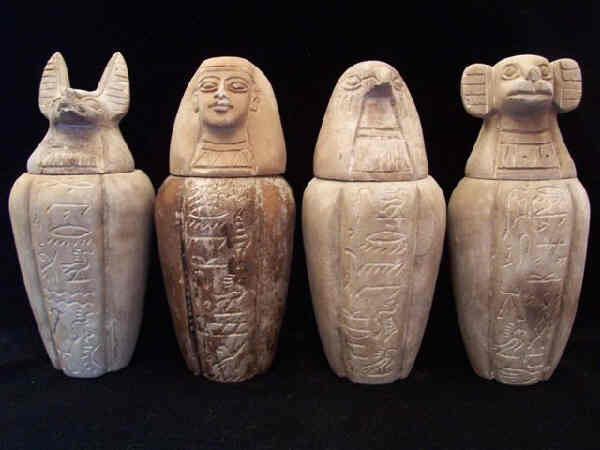 Your looking at a full set of canopic jars from ancient egypt. 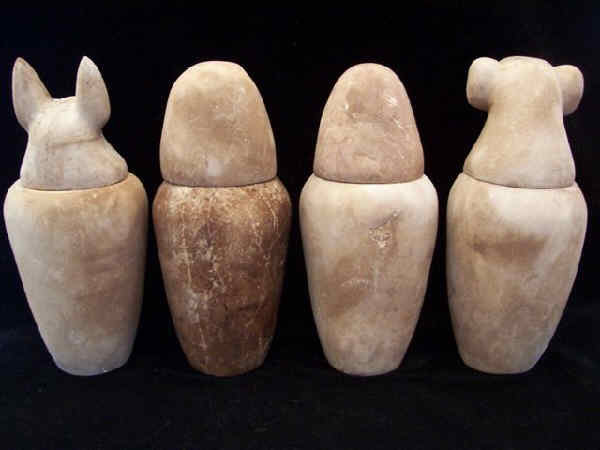 These jars would have been used as funerary equipment/tomb equipment . 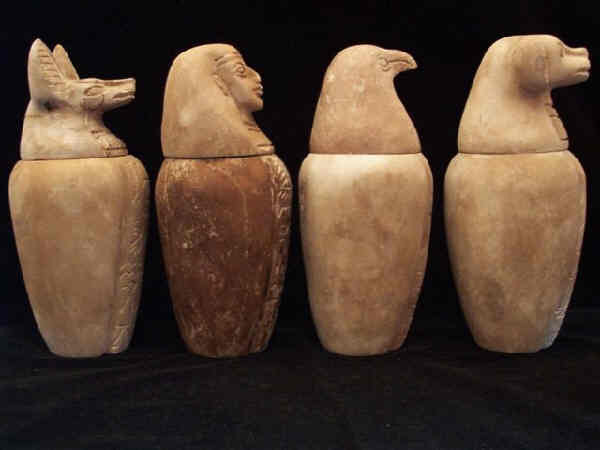 These marvelous jars include the 4 sons of Horus. God Hapi the baboon headed god whom was guardian of the lungs, Qubsenuef God and Guardian of the intestines, Duamutef God and Guardian of the Stomach, and lastly Imsety God and protector of the Liver. This is an exciting and rare auction. Donot miss out. purchased from An antique dealer. I obtain my items from various sources (antique dealers some of those dealers have been working in this business since 1930's and 1940's) private collections and or estates), We have received all information regarding our items from second hand sources, and the timeline set on our items is to be used as a guideline for the above period listed. Since I am a collector myself I tend to take pride in the items I aquire. These pieces are wonderful and we present them as they have been represented to us. why private auction ?! We value our customers and their individual privacy as well. Therefore we choose to keep our auctions and feedback profile private. This not only protects our customer list from unethical or predatorial sellers but also prevents unethical vultures from preying on our customers with out of Ebay sales which is risky and against Ebay policy and user agreements. Imsety jar tall: 19.7 cm ( 7 3/4 inch) xcircumference27.5 cm(10 3/4 inch) Qebekh-sennuef: 9.7 cm ( 7 3/4 inch) x circumference27.5 cm(10 3/4 inch) Hapy jar: 9.7 cm ( 7 3/4 inch)xcircumference28 cm(11 inch) Duamutef jar: 19.7 cm ( 7 3/4 inch)xcircumference28 cm(11 inch).